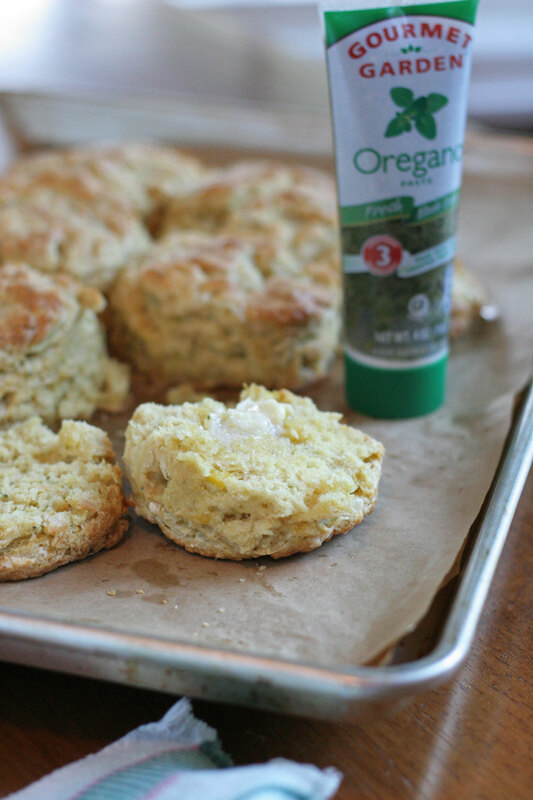 Herb squash biscuits?!!! Yes. Ok, it’s just a smidge of squash but it’s there, and it is totally necessary. The squash made friends with the Gourmet Garden Oregano that I used in this recipe. They played off one another to give this biscuit a deep savory note that I love. I am a biscuit lover by default. My Mama loves biscuits, so I started playing with them in Culinary School. It’s actually a funny story… Remember when I was in Culinary School? That was crazy fun. We had assignments in each class to complete a list of items, then they would get graded at the end of class. This was breads class, so we had a lull about an hour in after prepping, and proofing our dough. We were an early bird class at seven am, so by nine we were always hungry. I had some extra time, and I tended to play around and make us all breakfast. I got to making biscuits with an egg on top. I had never made biscuits, and my instructor gave two or three tips and basically said, good luck, it’s ok if they don’t turn out the first time. That is a crazy challenge for me, it’s on! I made them quickly because you have to work quickly, as to not melt the butter. I pulled them out of the oven, they were perfect. No joke, perfect flaky layers, light, fluffy, and my teacher laughed. Since then, I have worked on a variety of biscuits, and textures. People are very particular when it comes to their biscuit recipes. I like a flaky buttery texture, versus a cake like biscuit, I really don’t like those. Using a product like Gourmet Garden herbs works so well with recipes like this, it’s super easy to mix it in with the milk. It doesn’t mess with the texture like fresh herbs can. The high quality of these organic, gluten free herbs are so easy to incorporate into your everyday use, and make any dish a bit more special. I used the oregano for a subtle earthy flavor to go with the goat cheese. 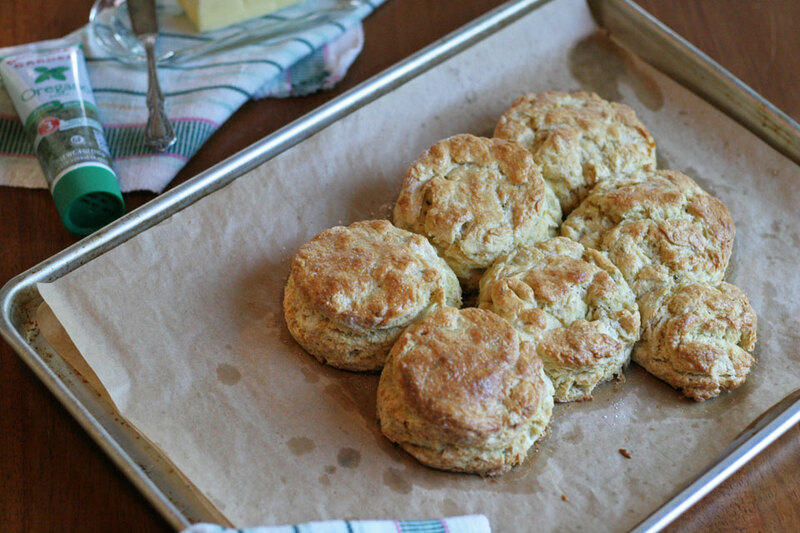 All of that balances with the super savory notes of the squash, and made a tender, flaky, herby good biscuit. Herb Goat Cheese Squash Biscuits are the business. You can use all purpose flour, or a fine flour. I use a fine flour, not cake flour. Lower protein content of a fine flour creates a lightly texture. Keep everything very cold. The butter cubes, and milk can be kept in the fridge until you’re ready to mi it all together. DO NOT OVER MIX. You see how I emphasize this :). It will make a tough dough, which is not good. When using biscuit cutter, do not turn the cutter. Press straight down, and bring straight up. Turning the cutter creates lopsided biscuits. It breaks the flaky layers. Squash: You can use any squash, I used kabocha. You could also use canned pumpkin, sweetpotatoes, yams, russets, or any variety of starch in the squash/potato families. I roasted the squash sliced in 1/2 at 450 degrees for 30 minutes, until tender. I used what I needed for this recipe, and made dinner with the rest of the squash. You could also freeze the leftover squash for later use. Here are a couple of recipes that would go awesome with these biscuits, and use the rest of the squash or potatoes! 1. 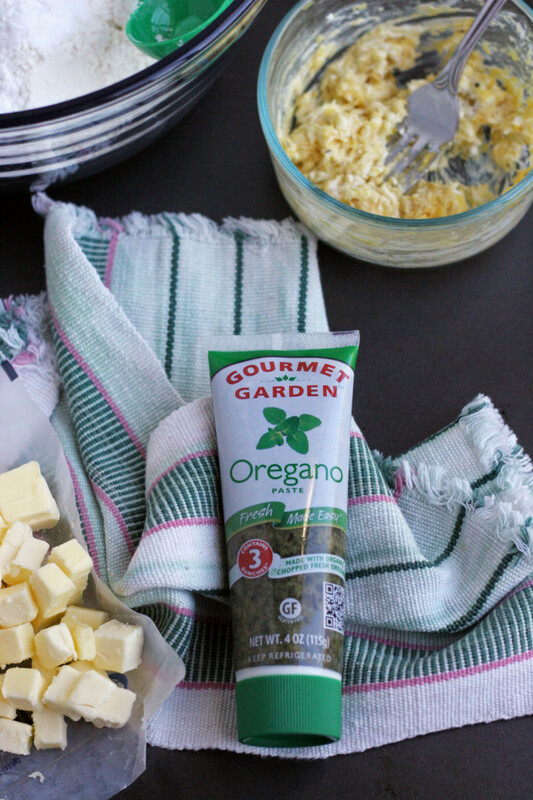 Add Gourmet Garden Oregano to the milk, whisk together using a fork. Mash the squash and goat cheese together, add to milk, whisk together using fork. 2. In a large bowl, whisk together flour, baking powder, baking soda, and salt. Add the cold butter cubes to the flour. Toss into flour, then rub butter into flour using your fingers, creating small pea sized chunks. Work quickly but gently. Add the milk/herb mixture to flour, using a spatula, mix gently until just combined. Do not over mix here. 3. Turn dough out onto a lightly floured counter. Bring dough together using your hands, forming a circle about 1 1/2 inches thick. Using the biscuit cutter, press straight down, do not turn. Bring together after each cut, gently and press dough together. Place on parchment lined baking sheet. If you have time and space, place in the freezer for 10 minutes. Brush tops with egg wash, place in oven and bake for 18-20 minutes. Remove and cool for a few minutes before serving. Serve warm with a variety of dishes like breakfast, ratatouille, or tasty soup! 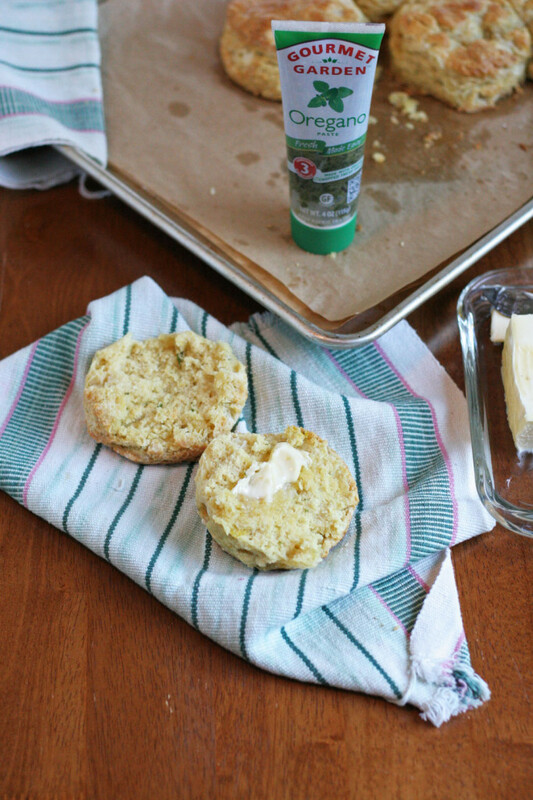 My family would love these savory biscuits! These look so delicious, I use Gourmet Gardens all the time, so convenient and delicious!!! I love Garden Gourmet Lemongrass. That’s one of my favourite kitchen convenience items! These biscuits look amazing! Thank you, Rebecca! I love the lemongrass too. These look amazing. .all of my fav flavs!